Most Australians live in the coastal regions, and for good reason, the interior is dry and hostile to settlement. Central Australia is often called Australia's dead heart and was not properly explored until well into the 20th century. Perhaps the most daunting region is the Simpson Desert. The Simpson is a 170,000 sq km sea of red parallel sand dunes. The mean annual rainfall is only 130 millimetres and summer temperatures can exceed 50° C. The Aborigines ventured in during a good season but they would have had no reason to cross the wasteland. The first European to see it was explorer Charles Sturt in 1845 but it was not until the 1930's that it was fully recognised by explorer Cecil Thomas Madigan who named it after his sponsor Allen Simpson. Seventy ago Ted Colson made history by being the first European to cross the theSimpson. Colson was an experienced bushman and explorer. He had been a cameleer and guide on other expeditions and understood several Aboriginal dialects. Colson and his wife were sheep farmers at Blood Creek, near the desert's border. 1936 was exceptional wet and and Colson saw good rain the East. He knew this was a rare opportunity to attempt a crossing. 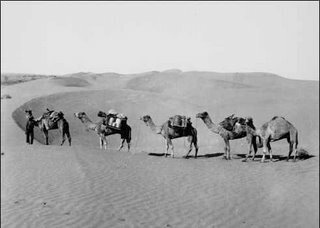 So on May 26th he set off with his young Aboriginal companion Peter Ains and five camels. They climbed a thousand sand hills with only a compass for navigation, but thanks to the rare rain the desert had become “one vast field of herbage, grass and shrubs”. Finally on 11th June 1936 the two men walked in the Birdsville pub. After three days re hydrating, they set off to cross the desert again to return home. . This time they tried a more southern route. On the way they stopped at Poeppel's Corner, the point where the Queensland, Northern Territory and South Australian borders meet and Colson nailed a tin plate bearing his initials and date to a peg. They arrived back on 29th June. In 1939 Cecil Madigan organised a major expedition to explore the Simpson. Madigan was a geologist and had been to Antarctica with Mawson. This time the party had nine men including a biologist, botanist, photographer and a radio operator. Transportation was by 19 camels. They took a radio transmitter and made regular broadcast on public radio. The expedition had much publicity and overshadowed Colson's expedition. To this day some sources still begrudge Colson's achievement. I doubt the establishment were very pleased to be trumped by an amateur. The Simpson Desert was first crossed by motorised vehicle in 1962 by geologist Reg Sprigg and his family but has since become a destination for adventurous tourists. Theres no real roads so travelers need a well prepared 4X4 vehicle. Its a good idea to travel in a team as a breakdown can be fatal. Thats what sensible desert explorers do but there are alternatives. See the picture below. 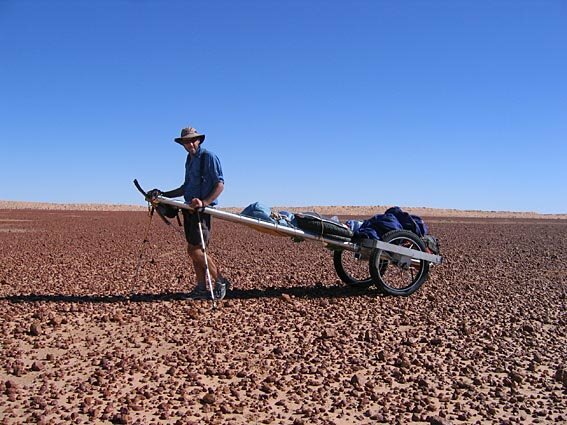 In June 2006 Lucas Trihey completed the first solo and unassisted foot crossing of the Simpson Desert . 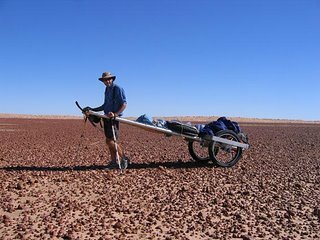 It took him 17 days and he had to trudge his cart for over 400km through sand dunes and scrub, sleeping in the freezing desert air at night. Such a journey would have astonished Colson and Madigan, but it was possible due to modern technological developments such as lightweight materials, GPS and a better understanding of nutrition and food preservation. The technology allowed the mass to be dramatically reduced, making the journey possible. Today modern explorers use similar technology to achieve remarkable results in the polar regions and on long sea voyages. Now the big hurdle to space exploration is cost. The Elon Musks and Burt Rutans of the world are trying to reduce cost by developing cheaper launch vehicles. But another way to reduce costs is to reduce the total mass that the mission requires. When the two converge I expect human space exploration will really take off.